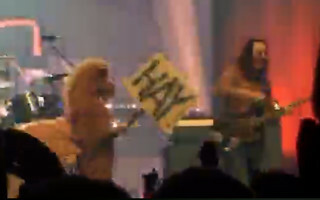 During the 2112 intro a pantomime horse came onstage. Geddy cracked up when he turned around and saw it. Then, when the explosion happened the horse fell over dead. Edited by x1yyz, 22 July 2015 - 02:55 AM. Interests:Concerts, Music, Amusement Parks, Road Trips, Laughing. It sure looks like the roadies are doing goofy stuff without the prior knowledge of the band, as they seem to be genuinely surprised. This appeals to my silly side. A photo of a guy with long white hair and beard asking "Have you seen this wizard?" was taped to an onstage amp. 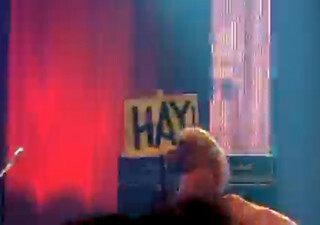 The pantomime horse returned during 2112, this time carrying a sign that said "Hay" to get people to yell. It was cool when Alex had his copy of the YBG newspaper and mocked wiping with it in Seattle...that was an awesome tribute! I am so jealous that you have seen all these shows. Did COTW tell you that he saw you on the big screen? No! During what part, do you know?! 2nd set in Portland was filled with fun moments. Towards the end of Neil's solo in Cygnus, Alex came out and sat on a road case on the side of the stage and started air drumming really really poorly, turned out and looked at us is the first few rows and shrugged lol. It was when we were driving back to the hotel. I was really tired at that point. I am sure he knows. 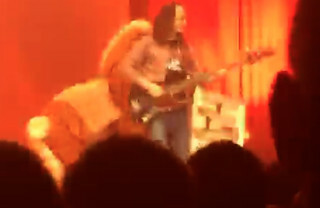 Alex dancing like a little girl after Geddy said "We're excited to be here!" Not really the band but before DEW Geddy said "Alright... where to go now?" and some guy next to me yelled CANADA in respone. Got it on video on my Youtube channel. A nod to Animal House!